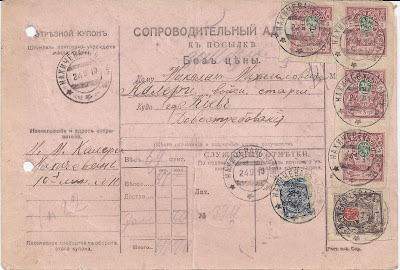 In the 1920s, Money Transfer Forms and Parcel Cards from the 1917 - 21 Soviet archives were passed to the Soviet Philatelic Association and maybe other organisations. There they were used like corpses for organ donation. 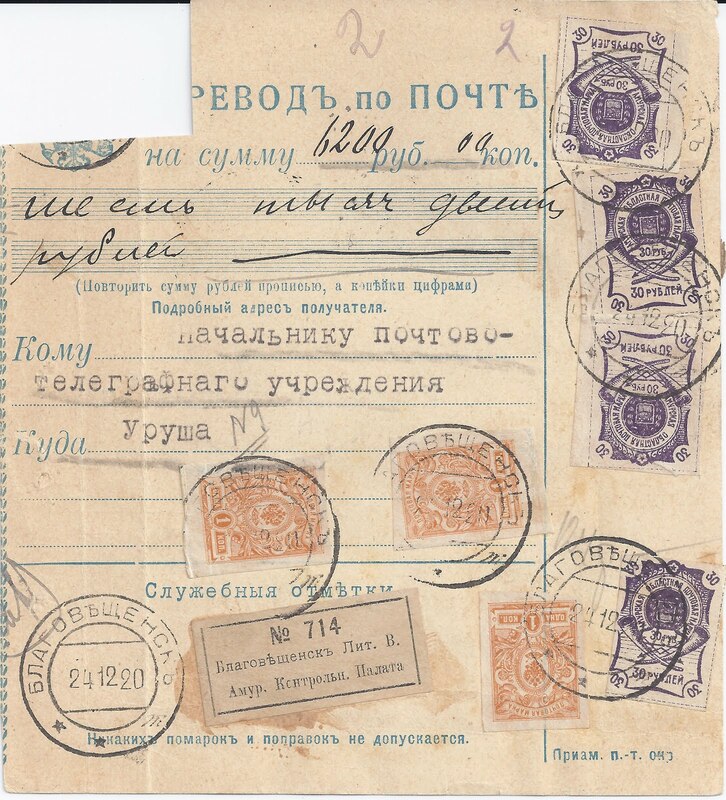 First, stamps were peeled or steamed from the back of the Formulars, as in the example shown above. This provided an initial supply of used stamps for philatelists who wanted used stamps. 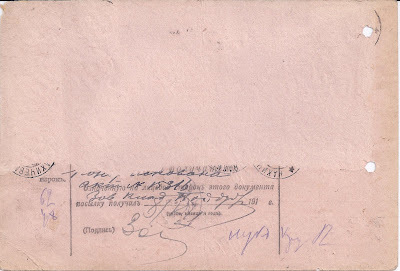 In the case of the example illustrated, the process turned a very attractive piece of postal history into damaged goods. Then the fronts of the Formulars were raided - stamps were clipped from them, individually, even if they were part of a block or strip. 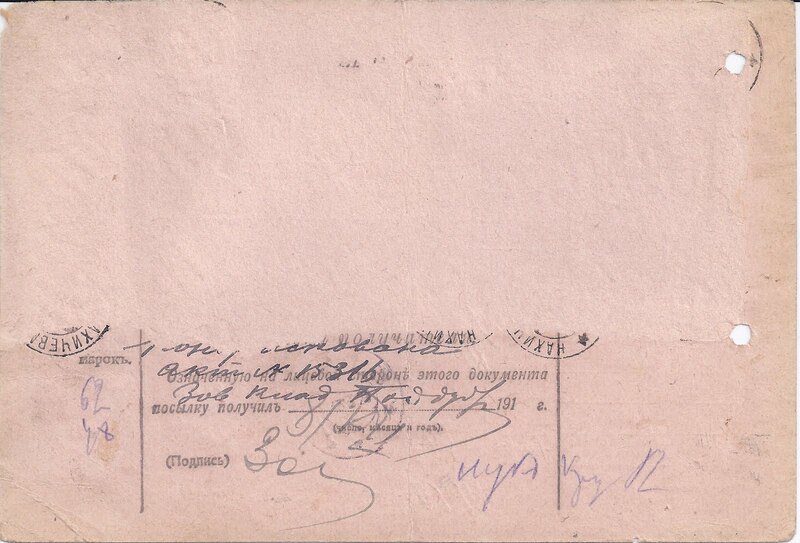 In the example below, the Formular has been clipped to provide just one copy of a 1 kopeck imperforate. The stamp had been placed to cover up the Imperial Arms at top left and completed the franking of 124 roubles (6200 roubles transferred x 2% = 124 roubles, provided by (4 x 30r Blagoveschensk issue) + (4 x 1 kop x revalued 100) = 124 roubles. Alternatively, all the stamps were soaked off, sometimes causing water damage - this is very obvious on 10 rouble Denikins, the red ink of which is partly water soluble. Eventually, the remainders of the corpse with a few stamps adhering - or sometimes none at all - were sold off. I would like to know more about this history. Many thousands of Formulars must have been treated in this way. Very few now remain intact. I think that most went through Soviet hands, but it is possible that some Ukrainian Formulars (for example, those of Podillia) were taken into exile by National Republic officials. I would be grateful for more information on who did what, when and for whom!